Need help. High speed ram performing same as slow. Discussion in 'Processors and motherboards AMD' started by Maynardcrow, Jan 18, 2019. I recently bought the tridentz 3600mhz cl18 ryzen ram and switched out my flarex 2400mhz cl15 ram. I had flare x stable at 2666 16 15 15 15 39. And now have tridentz stable at 3400 16 18 18 18 36. Now every bench Ive ran performs the same as my old ram. I havr ryzen 1600 at 3.9ghz at 1.386v and a 1080 ti at 2000mhz. My psu is rm750x. oh tridentz is hynix cjr cdie if that helps. If anyone has any suggestions it would be appreciated. Thank you. 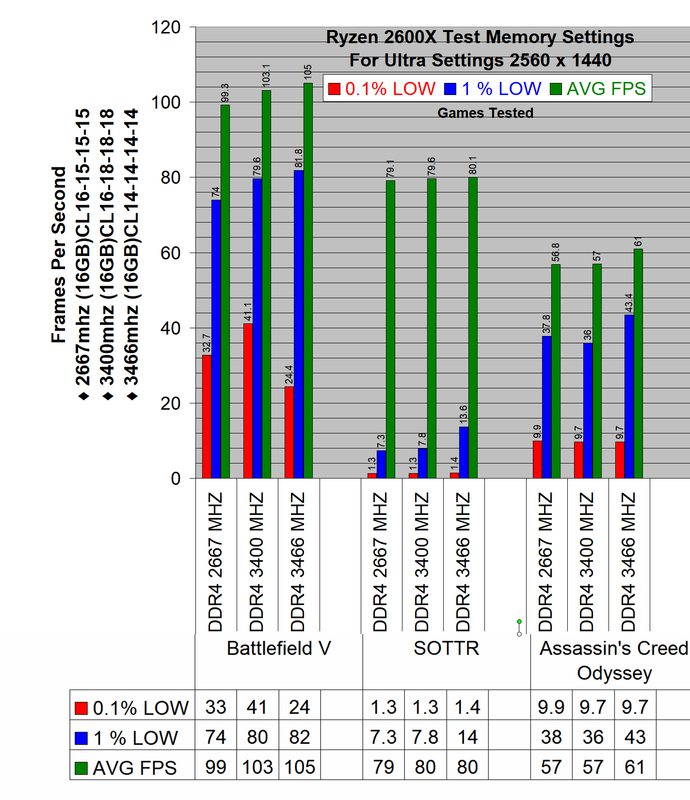 Need some more information or show the benchmarks your talking about or is it gaming.Try something like this benchmark. ive been working but tomorrow im off will try to get those benchmarks for you. Sorry. i do need help with this though. Thank you. edit: yes it was gaming but found out they werent the titles for memory testing. Well I done some testing on a GTX 1080TI and there is no big difference in gaming at 2560 x 1440 Ultra/Max setting with DDR4 Ram . Here is a chart I done up. Ok. that explains alot. I tested with sottr and AC origins and devision 2 at 1440p max everything and got no difference just like you. I just got home and downloaded aida64 and started to benchmark and its not giving all imformation cuz its a trial version. itll only give me write speed and latency. Is there another benchmark i can use. For youtube videos maybe they are just running games on lower resolution ,intel CPUs like 9900K also you would have to link the videos but they could be testing 2133Mhz against 3400Mhz ,For me though you do not get GTX 1080TI to run 1280 x 720 or something silly like that. The videos ive watched were in 1080p but like big names like hardware unboxed would show big gains. I thought those gains would carry over to 1440p. My cpu is still bottlenecked at that resoulution so i thought the extra ram speed would help make the difference. Its just confusing cuz i thought it would be this night and day difference. I dont know. Ill try these other benchmarks and see what i get. And dram calculator wants me to do these crazy timings at 3400 14-15-16-17-28. I dont even want to try that cuz i dont think hynix could even pull that off at safe voltages. Well I have never tested the memory at 1920x1080 anything is possible,it is like a lot of crap people are just trying to rip you off,it just maybe different tests different computer who knows. Here are 10 other games I tested and still no difference with dual channel at ultra 2560x1440,single channel there is a difference but still not much. I cant figure out how to insert pictures. But 2666 had a read speed of 41000 and a latency of 62ns. then 3200 16-18-18-36 read 47000 and latency is 74ns. 3400 was 49900 and 71ns. 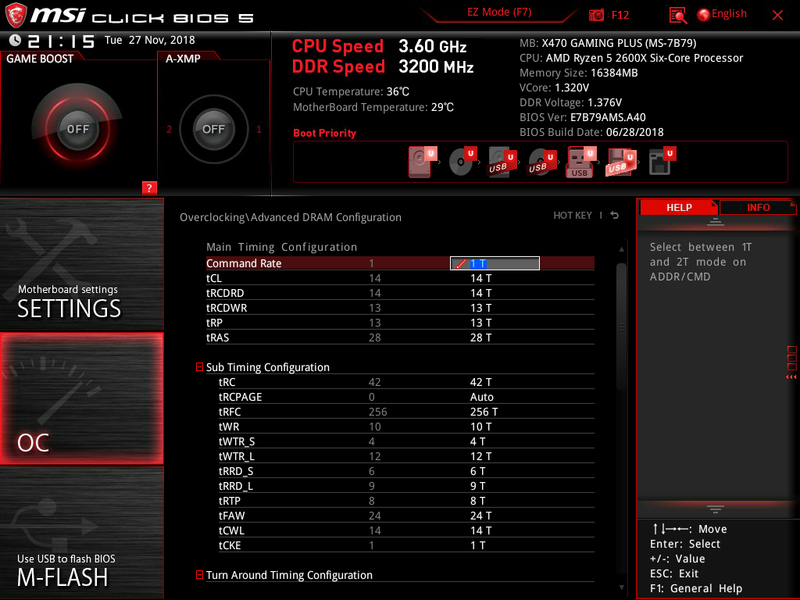 And also the cinebench scores were 1315,1322, and 1324. So i guess there is a difference just not the difference i was looking for. Thank you very much man. I really appreciate it. Sure no problem,you can always get that latency down some and score a little higher in that benchmark,just adjust subtimings.You could even try these ones. Well some people test for 6 months and never stopped messing around. Well if you got a BSOD try this with those settings put DRAM Voltage to 1.38 . That's what Ryzen DRAM Calculator is for !! Usually when you have memory that's on the QVL you don't need to mess with ProcODT etc. i recently tried what timings dram calculater told me to and didnt even want to boot. It boot cycled three times then got error massage from bios saying i didnt shut down properly when it shut it self down. 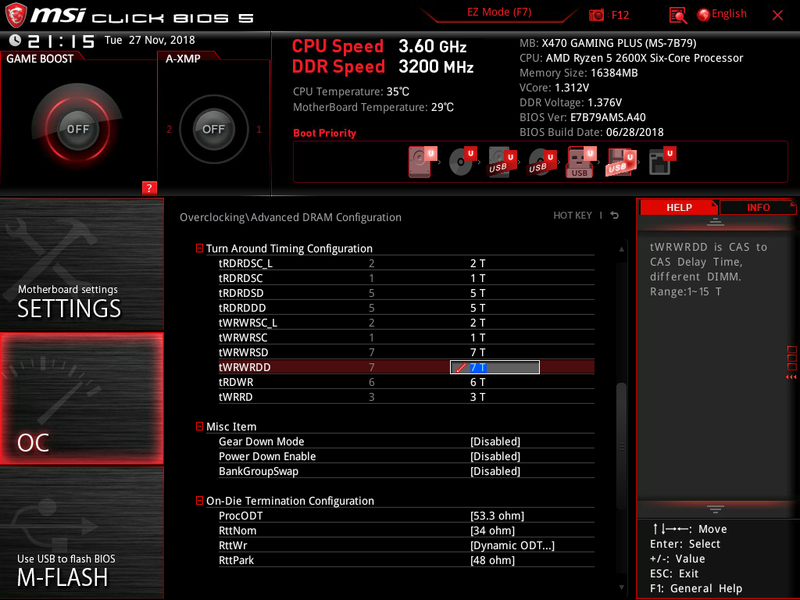 I think hynix cjr is too new still. I think i might return the memory cuz at 1440p im not getting any benefits from it like i thought i would. Ryzen 1000 series was more memory dependent than Ryzen 2000 series. Faster memory had a more noticeable affect on overall performance.